On March 7, Daegu announced the official launch of DTRO Singapore for the promotion of successful projects between Daegu Metropolitan City, Daegu Metropolitan Transit Corporation (DTRO), and Sentosa Development Corporation (SDC). 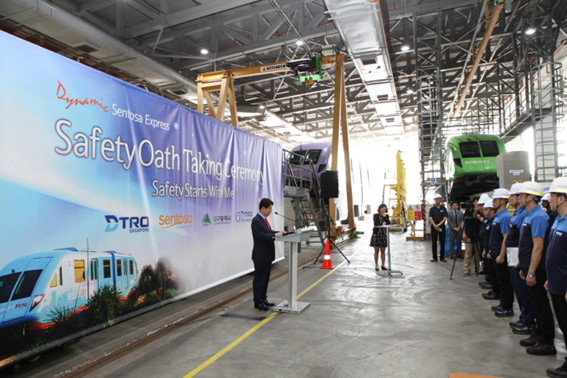 The city also announced that a ceremony was held to celebrate the launch and to confirm the resolve to promote safety. □ For five years from March 2019 to February 2024, DTRO will be operating and managing Singapore’s monorail system, Sentosa Express, which connects the mainland Singapore to the Sentosa Island. ○ At the ceremony held on March 7 to mark the official opening of DTRO Singapore, DTRO’s local subsidiary, Daegu mayor, the president of DTRO, and representatives and officials of SDC confirmed their resolve to promote safety, hoping to ensure successful service and zero accidents or disruptions in the next five years. ○ The duration of the contract for the operation and maintenance of the Sentosa Express is five years (March 2019 to February 2024). The total project cost is KRW 18.6 billion (KRW 3.72 billion a year). DTRO will be in charge of maintaining and repairing the monorail system’s cars and facilities. In addition, DTRO plans to expand the project in the future and is expected to provide a more comprehensive operation and maintenance plan including heavy maintenance for the system after five years. ○ In July 2018, DTRO signed a contract for the operation and maintenance of the Sentosa Express. In October, DTRO Singapore was established, and pilot operation of the Sentosa Express was conducted from February 14 to 28 this year. Due to the success of the pilot program, DTRO Singapore began the full operation and maintenance of the monorail system starting in March. ○ This is the first time a mass transit operation service from Daegu was exported. It is also significant that the excellence of Daegu’s monorail operation and maintenance system, which Daegu was the first in Korea to adopt, received recognition from overseas. ○ The Sentosa Express is the same monorail system as Daegu Metro Line 3. It was opened in 2007 to connect the mainland of Singapore to the Sentosa Island, a world class vacation spot located about 800 meters off the shore of Singapore. Spanning 2.1 kilometers, the Sentosa Express is used by an average of 13,000 people every day.